While in Wimbourne, we discovered that we could buy a day pass on the buses and travel anywhere we pleased. So, bright and early next morning, we cycled into town and boarded a nice shiny bus and took a trip to the seaside! 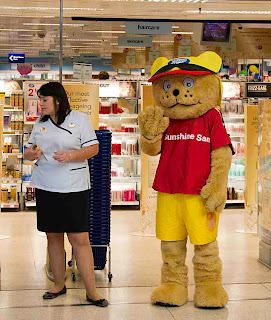 Today, Bournemouth is a large coastal resort town in the county of Dorset with a population of about 160,000 and, in a 2007 survey, it was ranked the happiest place in Britain, with 82% of respondants reporting that they were happy with their lives. Until 1812, what is now Bournemouth was remote, barren heathland at the mouth of the Bourne River with zero inhabitants. The first residents were a retired army officer, Lewis Tregonwell and his wife, who moved into their new home built on land he had purchased. He began populating the rest of his land with small villas for holiday rentals. Tregonwell planted hundreds of Pine trees to provide a sheltered walk to the beach which later became Invalids Walk. When he died twenty years later, Bournemouth was established as a small community. The Town Hall was built in the Victorian period as a hotel for visitors to the town after the city's growth accelerated following the arrival of the railway and Bournemouth became a recognized town in 1870. Originally part of Hampshire county, Bournemouth was "moved" to Dorset in 1974. 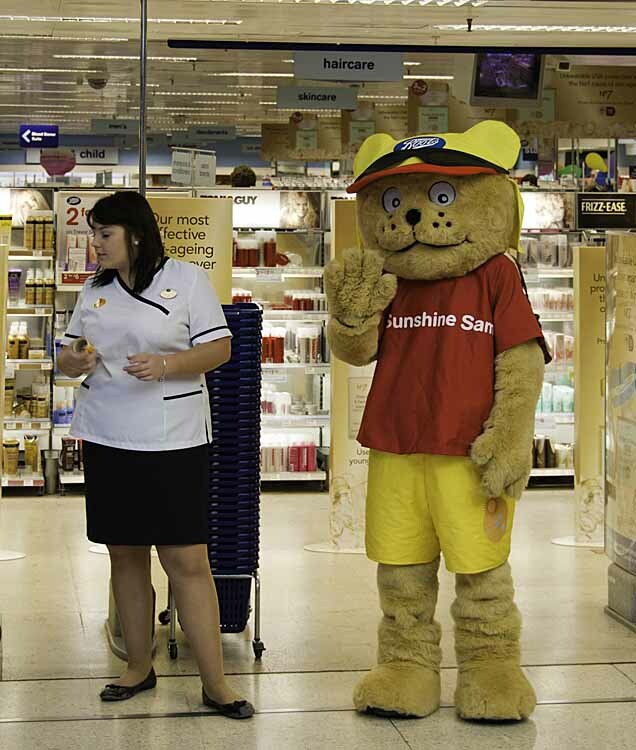 Like the rest of Dorset, more than 90% of Bournemouth's workforce is employed in the service sector. Tourism is a crucial industry generating more almost 3/4 billion dollars each year. Poole is a large coastal town and seaport in the county of Dorset, on the south coast of England about four miles west of Bournemouth. It is home to almost 140,000 people. 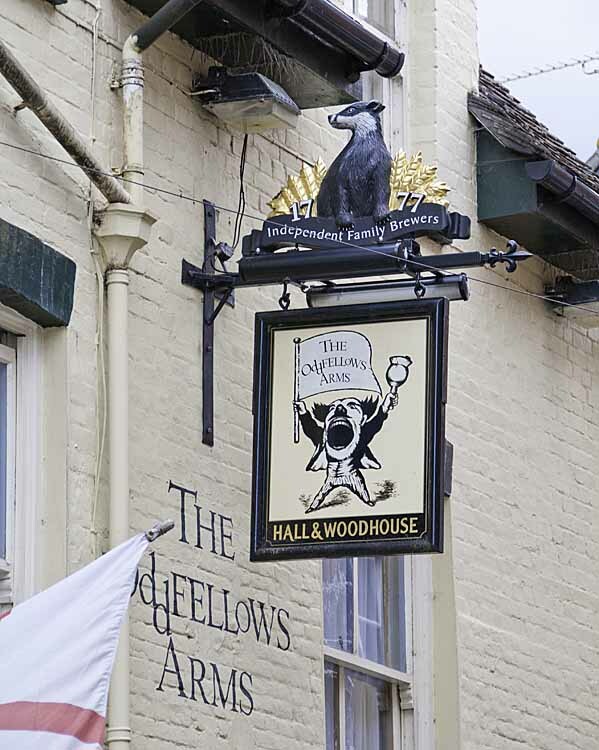 People have been living around here since before the Iron Age and the earliest record of the town’s name is from the 12th century as the port grew around the wool trade. In later centuries Poole forged trade links with North America and, at its peak in the 18th century, was one of the busiest ports in Britain. During World War II, Poole was the third largest embarkation point for D-Day landings in France and afterwards served as a base for supplies to the allied forces. Eighty-one landing craft containing American troops from the 29th Infantry Division and the U.S. Army Rangers departed Poole Harbour for Omaha Beach. During the 1970s, Poole’s permissive regional planning policies attracted service businesses from London and the area economy moved from manufacturing to the service sector with tourism high on the list. Poole Quay at the south of town centre is lined with a mixture of traditional public houses, redeveloped warehouses, modern apartment blocks and historic listed buildings. Once the busy centre of Poole's maritime industry it is now predominently a tourist attraction. The Grade II* listed Customs House, built in 1814, now functions as a restaurant and bar. Poole's sandy beaches extending 3 miles along Poole Bay are another tourist draw, replete as they are with seaside cafés, restaurants, beach huts and water-sports facilities. Poole harbor is is the largest natural harbour in Europe and, in conjunction with Poole Bay, is a magnet for sailing, windsurfing, surfing, kitesurfing and water skiing. Poole is a cross-Channel port for passengers and freight with up to seven sailings a day in the summer season. Lots more pictures here. Wimborne Minster is both the name of the town and the name of the main church. The town is known locally as Wimbourne while the church is known as the Minster. Wimborne, the town, is a market town of some 6,500 people in the county of Dorset, although sadly, the market has been moved out of the downtown area which has somewhat destroyed its character. 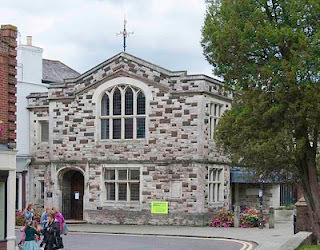 However, Wimborne is endowed with one of the finest collections of 15th, 16th and 17th century buildings in the county, especially the centuries-old Wimborne Minster, the Town Hall and numerous original shops and pubs. The Minster is a Saxon Church famed for its unique chained library and the tomb of King Ethelred, the brother of Alfred the Great. 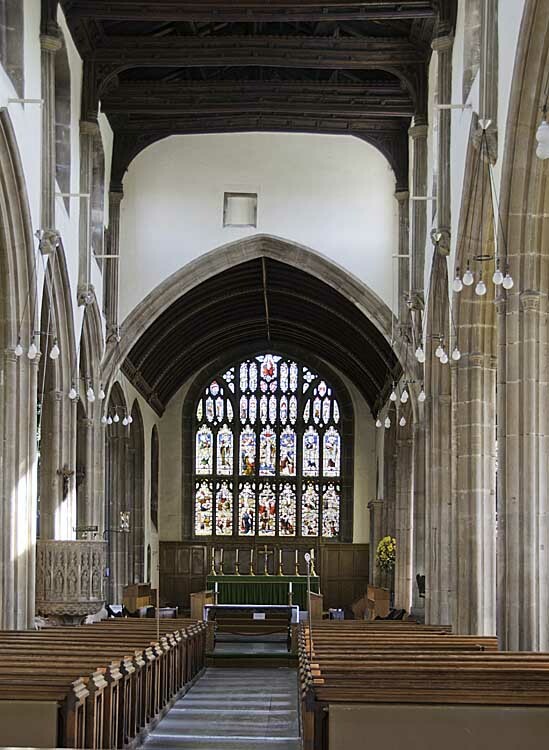 It is the parish church of Wimborne and has existed for over 1300 years. The central tower and nave were founded in Saxon times, but the surviving building is predominantly Norman with some Gothic components from various periods. One of its more famous architectural features is a working astronomical clock, which rings every hour. The minster is constructed in a combination of Dorset limestone and New Forest stone. The western tower is 95 feet high and a second tower, above the transepts, is 84 feet high. The thirteenth-century spire that formerly crowned the shorter tower collapsed in 1600. The organ dates from 1899 by J W Walker & Sons, and has had various rebuilds, two as recently as 2000 and 2006. Between the years 705-23 a double monastery was founded at Wimborne by Sts. Cuthburga and Quimburga, sisters of Ine, King of the West Saxons (688-726). The monastery was probably destroyed by raiding Danes in the ninth century and over the years, every trace of the Saxon buildings has vanished such that even the location of St. Cuthburga's Church is now uncertain. More pictures here. 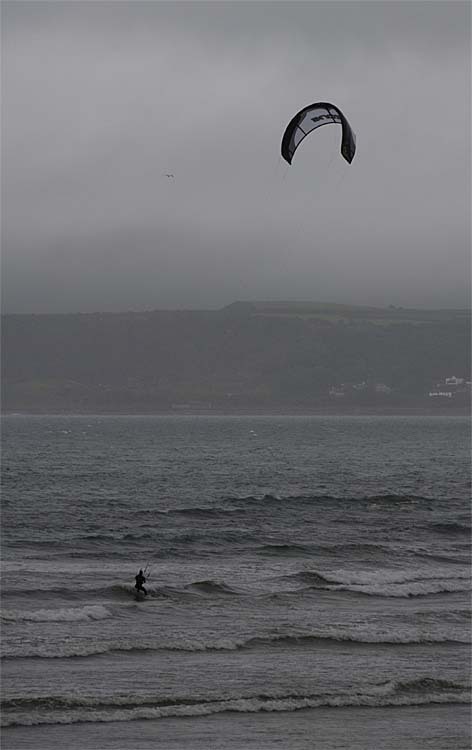 Home to about 1,700 souls, Charmouth, at the mouth of the River Char is in the county of Dorset. It faces onto Lyme Bay, part of the English Channel and dates back to the Iron Age and a Celtic tribe named the Durotriges. The name Charmouth probably originated in Saxon times from 'Cerne' meaning stony river. The cliffs above the beach are a noted source of Jurassic fossils making the area part of the Jurassic Coast World Heritage site, a 95 mile stretch of the south coast extending from Purbeck island in the east to the Exeter region in the west. 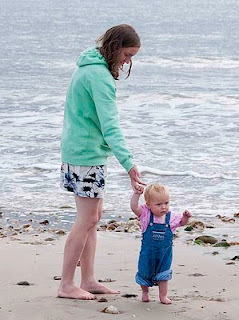 In the eighteenth and nineteenth centuries Charmouth was a noted resort numbering among its visitors the novelist Jane Austen. The buildings running along Charmouth's street vary in age, some of the smaller cottages are 17th and 18th century while further up the hill the Regency era predominates. Although the Queens Armes Hotel, a grade II listed building, looks like a Georgian house it is actually an early 16th century house that was re-faced in the 18th century. It once belonged to Forde Abbey and Catherine of Aragon is believed to have lived there for a while. In the 17th century, after the house became an inn, it gave shelter to the fugitive King Charles II in September 1651, when, in disguise, he came looking for a boat to take him to France following his defeat at the Battle of Worcester. Almost exclusively a residential community the only sign of commercial activity was a fossil shop on the beach which also sold some snack goods. More snapshots here. Dartmouth is a little way up the estuary of, wait for it, the River Dart. It is a tourist destination and has a population of about 5,500. Historically, Dartmouth was an important deep-water port used as the sailing point for the Crusades of 1147 and 1190, and the home of the Royal Navy from the reign of Edward III. The town was sacked twice during the 100 years war with France and, after the second attack, the estuary was closed by a chain every night and the narrow mouth was protected by two fortified castles, Dartmouth Castle and Kingswear Castle. Dartmouth also had the dubious distinction in medieval times of being a major base for "privateering", AKA state sanctioned and licensed piracy. The town contains many medieval and Elizabethan streetscapes and is patchwork of narrow lanes and stone stairways. 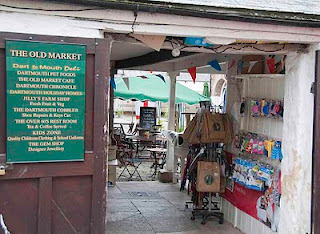 A number of the historic buildings are listed one of which is the Butterwalk, built 1635 to 1640. The Royal Castle Hotel was built in 1639 on the then new quay while a claimant for the oldest building is a former merchant's house in Higher Street, now a listed public house called the Cherub, built circa 1380. Dartmouth sent numerous ships to join the English fleet that attacked the Spanish Armada in the 17th century and the Spanish Armada's "payship", commanded by Admiral Pedro de Valdés, was captured along with all its crew by Sir Francis Drake. Local folk lore tells how the ship was reportedly anchored in the river Dart for more than a year while the crew were used as laborers on the nearby Greenway Estate. Centuries later, Greenway was to become the home of Dame Agatha Christie. In the latter part of World War II the town was a base for American forces and one of the departure points for Utah Beach in the D Day landings. Much of the surrounding countryside was closed to the public while it was used by US troops for training. More pictures of this backwater treasure are here. 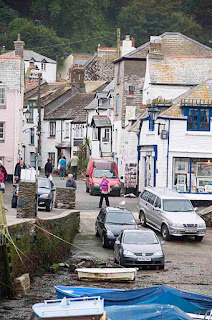 Our last port of call (literaly) in the county of Cornwall was Polperro, an acient village and fishing port on the south-east coast of the county. The fishing harbour surrounded by old, tightly packed fishermen's houses makes it magnet for tourists. 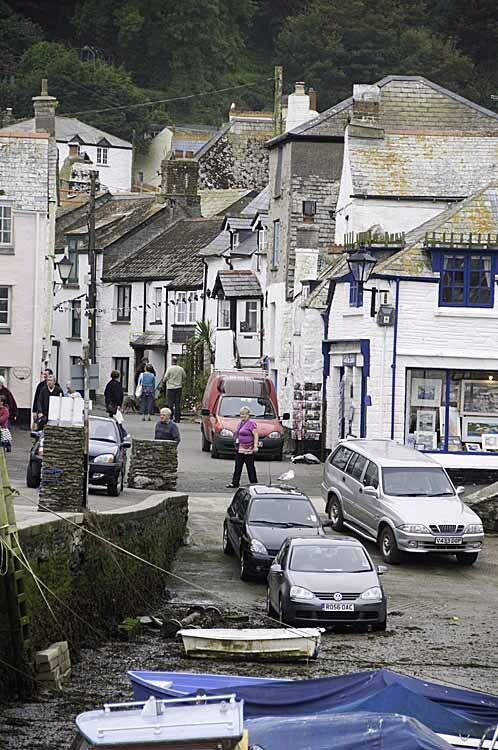 In fact, tourism grew to become Polperro's main industry during the 20th century with estimates of as many as 25,000 visitors per day during the summers of the 1970s. 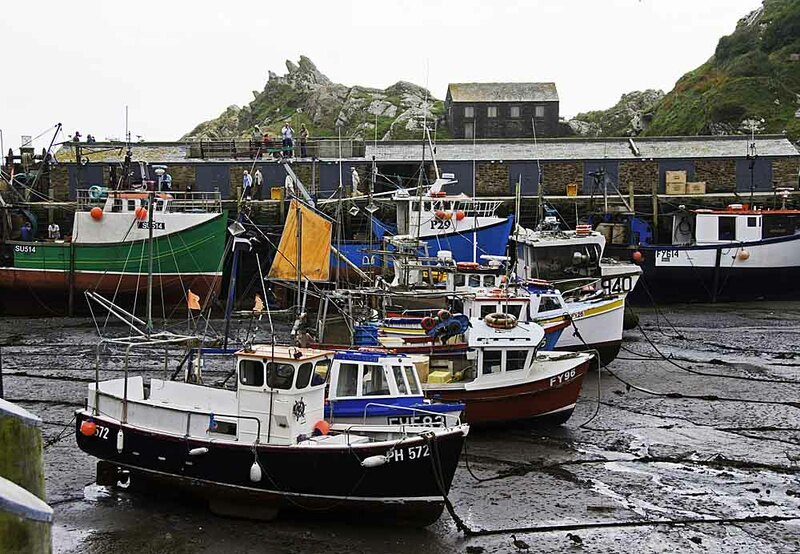 Fishing was traditionally the principal occupation of Polperro families and for centuries the village had been a pilchard fishing and processing port. Once ashore, the fish were salted, pressed and canned with the by-product oil being collected and used for heating and lighting. 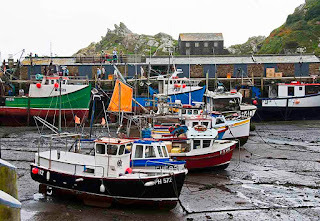 Smuggling also developed as a prosperous activity after Polperro established itself as a port in the 12th century and reached a peak in the late 18th century when Britain's wars with America and France resulted in high taxation on imported goods. This made it particularly lucrative for the local fishermen to boost their income by the illicit importation of spirits, tobacco and other goods from Guernsey in the Channel Ilses. A more organised Coast Guard service was introduced in the 19th century and this, along with stiff penalties, gradually deterred the smugglers. For more views of this picturesque village, click here. 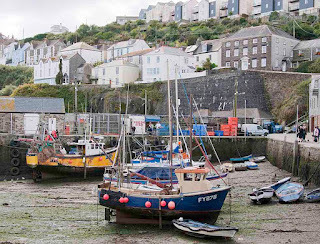 Mevagissey is cradled in a small valley and faces Mevagissey Bay to its east. There are more than 60 registered fishing vessels in the harbor which also offers tourist fishing trips and a passenger ferry to Fowey in the tourist season. Tourism has long since overtaken fishing as the primary economy driver. Known as Porthhilly as far back as 1313, Mevagissey was the outcome of a merge with the hamlet of Lamoreck in the 17th century. The new name was was formed from two Irish saints, St Meva and St Issey with the "g" borrowed from hag, the Cornish word for "and". At that time, pilchard fishing and smuggling were the primary sources of income for the locals and supported at least 10 pubs, just two of which remain. The inner harbor was built in the late 18th century with the outer harbor following about 100 years later. Amazingly, in 1895, Mevagissey built a pilchard-oil powered power station to run the lighthouse and local street lighting. 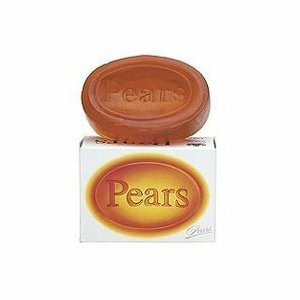 Pears' Soap is well known in England as an expensive and refined product. Andrew Pears was born in Mevagissey in 1768 and trained as a barber before moving to London in 1789. There he opened a barber's shop in the fashionable area of Gerrard Street, Soho and quickly noticed that the London upper classes cultivated a delicate white complexion as opposed to a tanned face associated with the working class. Pears recognized an opportunity for a gentle soap for these delicate complexions and found a way of removing the impurities and refining the base soap before adding the delicate perfume of garden flowers. The resulting product was a high quality soap which had a bonus distinction of being transparent. In 1835 Andrew partnered with his grandson Francis and moved to new premises near Oxford Street. Pears' Soap is now made in India by Hindustan-Lever, part Unilever empire begun by the Lever brother. More pictures of this picturesque village are here. The next stop on our eastward trek was a large campground near the almost forgotten village of Pentewan on the south coast of Cornwall. Thankfully, the weather had improved significantly, the rain had cleared up and the temperatures were back up in the sixties. 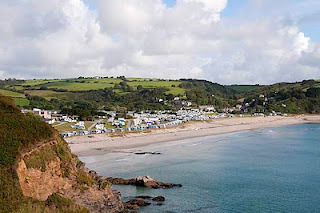 Pentewan is a small coastal village in south Cornwall, a one time port used by fishing boats and for shipping local products including tin, stone and china clay. The harbor is long since silted up and is now a hundred yards or so away from the edge of the English Channel. The village and its harbour date back to medieval times. Since 1945, Pentewan has been dominated by the large 'Pentewan Sands' caravan and camping site that covers much of the beach to the west. The village itself contains the Ship Inn, a post office, and several shops. 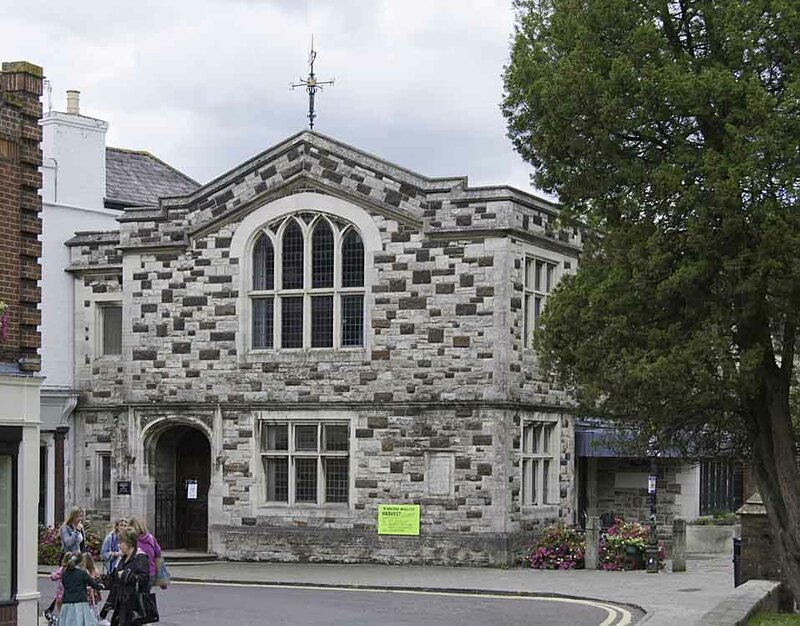 Pentewan Board School, designed and built in 1877/78 by Silvanus Trevail, is now a restaurant. 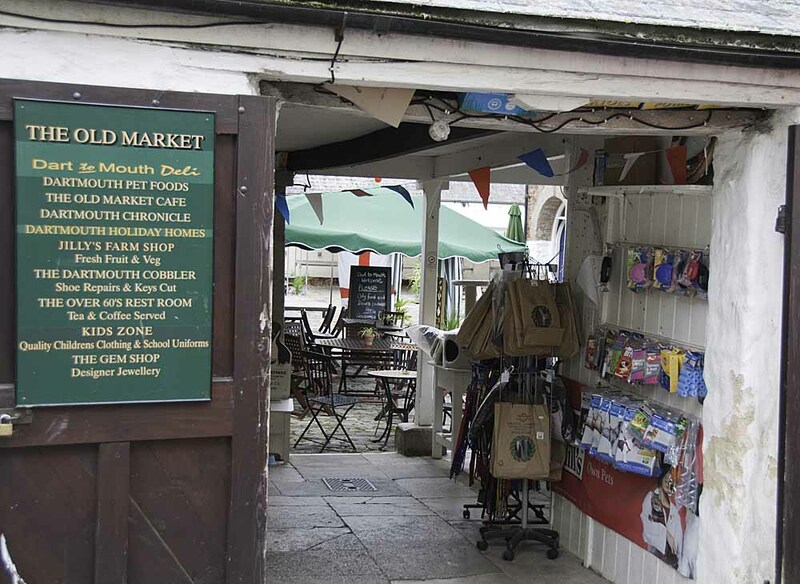 Many of the older buildings, as well as the harbour, are constructed out of Pentewan stone. 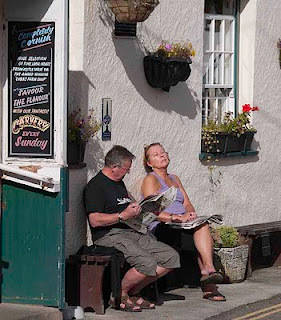 A second former village pub was named The Hawkins Arms, but has now been converted to a guest house called 'Piskey Cove'. Tourism is the only substantial industry remaining in the village. Pentewan was originally known as 'Lower Pentewan', 'Higher Pentewan' being a separate and earlier settlement to the south-west of the village. 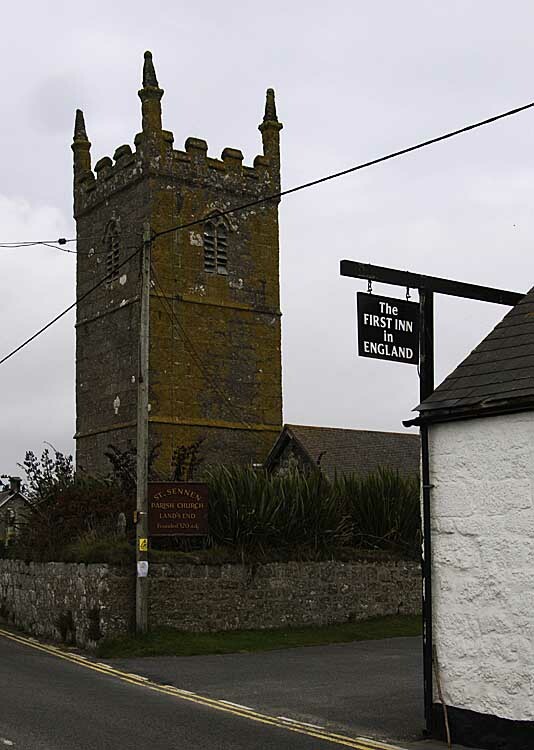 In 1086, Higher Pentewan was listed in the Domesday Book as the Manor of 'Bentewoin', one of many Cornish manors held by Robert, Comte de Mortain. During WWII a "pill box" gun emplacement was erected in the harbour and the beach was mined as part of the "Dragon's Teeth" anti-tank defences. An air raid on the port in August 1942 destroyed the Methodist chapel and damaged several houses. More pictures of this fragment of history are here. Having traveled the twenty miles from Penzance to Falmouth the weather remained foul. A quick visit to a scenic headland quickly convinced us to just go to our campsite and sulk - certainly a better option than the bonechilling rain that continued to fall. The following day the rain had largely passed and although we reprised the headland tour we still balked at a walkabout due to the continuing wind and cold. 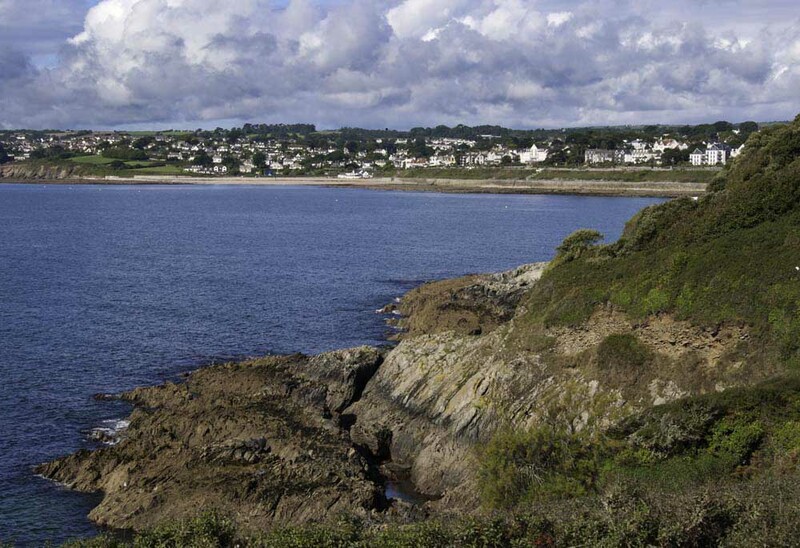 With a population of around 21,000, Falmouth sits at the mouth of the river Fal - hence its name. Simple isn't it? Many places around the English coast are named by this same logic wherever they are located at the mouth of a river. In this instance however, no one seems to know how the river got its name. Falmouth is famous for its harbor - the deepest in western Europe and the third deepest in the world - as well as its frequent choice as the start or finish point for various record-breaking voyages. The headland at the east end of town was known as Peny-cwm-cuic in Gaelic but later evolved to 'Pennycomequick' and became the site where Henry VIII built Pendennis Castle in 1540. The Falmouth Packet Service operated from here for over 160 years between 1689 and 1851 carrying mail to and from Britain's growing empire. News of Britain's victory and Admiral Nelson's death at Trafalgar was landed here and taken to London by stagecoach. The Cornwall Railway reached Falmouth in 1863 bringing prosperity to town, making it easy for tourists to reach the town and permitting the swift transport of the goods from the ships in the port. Many of the Georgian town houses have been converted into guest houses and small hotels and Falmouth has proven such a popular holiday destination that it is has morphed into a tourist resort. During World War II, German bombing raids killed 31 local inhabitants and an anti-submarine net was laid from Pendennis to St Mawes, preventing enemy U-boats from entering the harbor. Maritime activity has declined significantly from its heyday but Falmouth remains the largest port in Cornwall, handling cargo and bunkering vessels. For more views, click here. 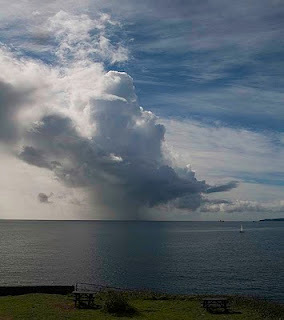 Penzance, or "holy headland" in the Cornish language, is a reference to the location of the chapel of St. Anthony that stood over a thousand years ago on the headland to the west of what became Penzance Harbour. The town is the most westerly major town in Cornwall and was granted various Royal Charters from 1512 onwards and finally incorporated in 1614. With a population of 21,000 the town's location gives it a temperate climate, warmer than most of the rest of Britain except, of course, when we were in town. We spent the night parked behind the seawall huddled against howling winds and heavy rain at unseasonably low temperatures. Being at the far west of Cornwall, Penzance and the surrounding villages were sacked many times by foreign fleets. In July 1595, seven years after the defeat of the Spanish Armada, a Spanish force under Don Carlos de Amesquita landed troops in Cornwall. The force seized supplies, raided and burned Penzance, looted surrounding villages, held a mass and sailed way, all before the cavalry arrived. Sadly, before buildings were listed and preserved for historical importance, Penzance tore down much of its old town and replaced it with second-rate commercial structures, the net effect of which has greatly diminished the quality of the area. Penzance was the birthplace of Sir Humphry Davy, President of the Royal Society who invented the process of electrolysis, isolated sodium, discovered laughing gas and proved, in conjuction with Michael Faraday, that diamonds are made of pure carbon. Today he is possibly best known as the inventor of the Miner's Safety Lamp, known as the Davy Lamp. Davy had discovered that a flame enclosed inside a fine mesh cannot ignite firedamp (methane). The screen acts as a flame arrestor though which air, and any methane present, can pass freely enough to support combustion, but the holes are too fine to allow a flame to propagate through them and ignite any methane outside. A few more pictures are here. 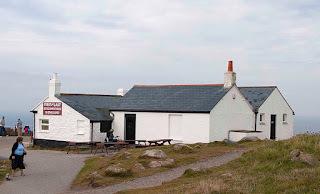 At the extreme south-westerly point of the British mainland, which is also the extreme westerly point of the mainland of England, lies Land's End, longitude 5 degrees 43 minutes. A small settlement on a headland of the Penwith peninsula in west Cornwall, Land's End has a romance and resonance far beyond its humble reality. Frequently cited to invoke the idea of great distance - Land's End to John o' Groats for example expresses the outer limits of Great Britain being the longest distance between two inhabited locations. John 'o Groats by the way, is a 300 population village in northern Scotland and is 838 miles by road from Land's End. 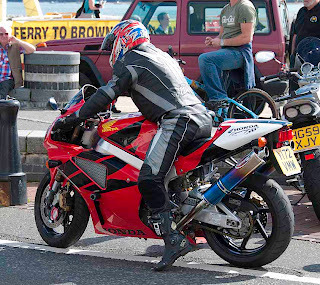 Inevitably, such a distinction leads to Land's End being the start or finish point of sundry races, walks and charitable events. Land's End was purchased in 1987 by Peter de Savary who began the serious commercialization of the renowned landmark with several new buildings and a nascent theme park. 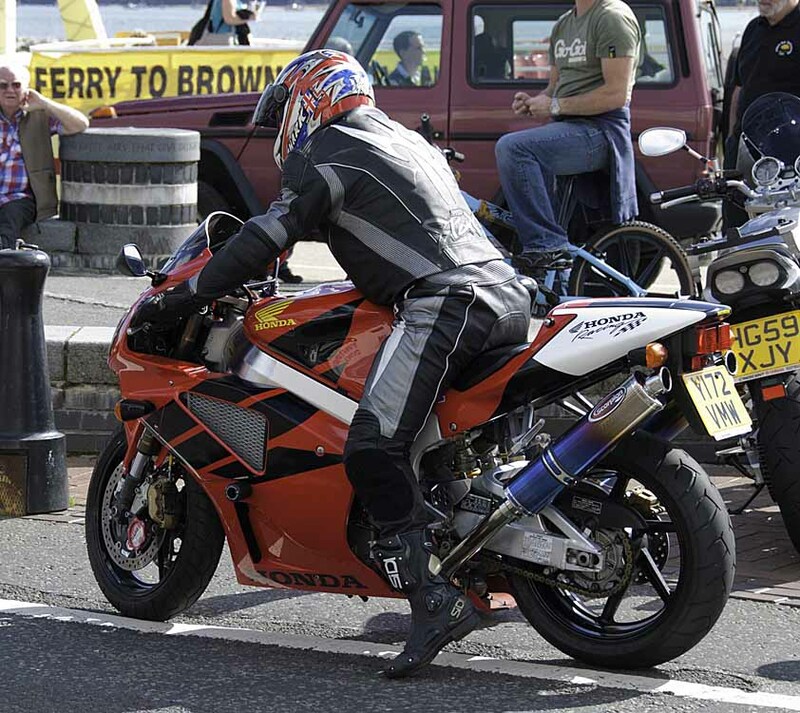 In 1991, de Savary sold both Land's End and John o' Groats which he also owned, to Graham Ferguson Lacey who, in turn sold it to the present owner, Heritage Attractions Limited, five years later. Philistine I may be, but the commercialization does not appear to have done much harm and may even encourage visitors to discover the area. Land's End is one of four small communities comprising the local civil parish, the others being Trevescan, Carn Towan and Sennen Cove. Sennan is the largest of the four and was on our agenda for the day. 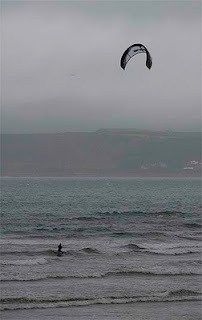 The population of Sennen is about 800 and it lies 315 miles west-southwest of London. 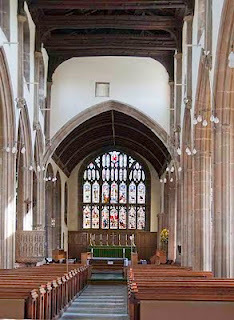 The parish church is dedicated to St Sinninus and has been there, in one incarnation or another, since the 15th century. There is a headless alabaster figure representing the Virgin Mary in the transept and a three-stage battlemented tower housing three bells. More views of the area on a cold and blustery day are here. At the only natural harbor in a twenty mile stretch of the north coast of Cornwall county (the Cornish coast), two little rivers, the Valency and the Jordan, run into the Atlantic ocean. 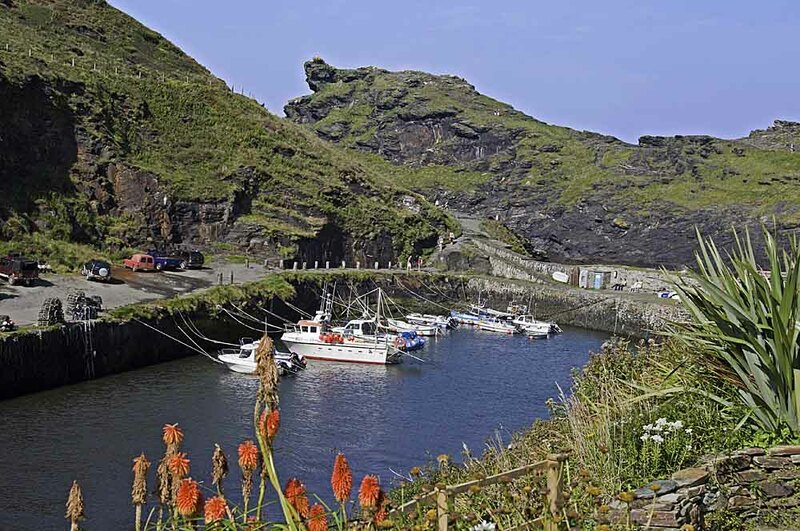 In the 12th century, Bottreaux Castle, a motte-and-bailey structure, was built at the top of the steep-sided valley and eventually gave rise to the name Boscastle. The harbor is itself is protected by two stone walls which were built in 1584. 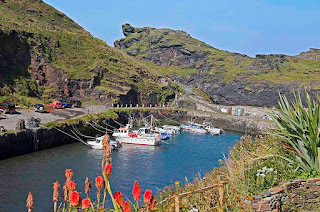 Boscastle was, for a while, a small port importing limestone and coal and exporting slate and other local produce in addition to being a fishing village. Today, the village is a popular tourist destination with a pottery shop, the usual range of "T" shirt and souvenir emporia and, of course, those crusty little critters known as Cornish Pasties were on sale everywhere. In August of 2004 a flash flood extensively damaged the village, trapping residents in houses or on their roofs and washing the entire visitor centre out to sea. The largest peacetime rescue mission ever mounted in the UK, using seven helicopters, rescued a total of 91 people with zero fatalities. About 50 cars along with the main bridge were washed into the harbor and, to make matters worse, the sewer system burst adding to the 9 feet of water swamping the streets. Good choice for a couple of hours walkabout, check here for more views. There are a few places in this world that act as magnets for spacy people. Mount Shasta, the town, on the side of Mount Shasta the mountain in Northern California, is one such. Swarming with unkempt aging hippies in tawdry knee length sweaters writing unintelligible verse and all the while mesmerized by the mountain's imagined magic powers. Glastonbury, we discovered, is another such place. 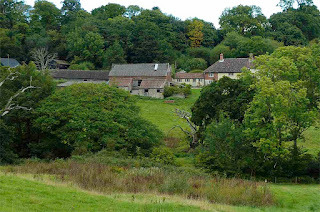 A small town in the county of Somerset with a population of around 9,000 it is centered around a defunct abbey that has been there since Saxon times. The abbey came to a violent end during the Dissolution and the buildings were "quarried" for use in local building work. Many of the oldest surviving buildings in the town are associated with the abbey. 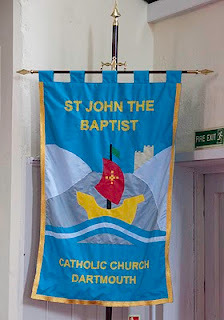 The Church of St John the Baptist on High Street dates from the 15th century. 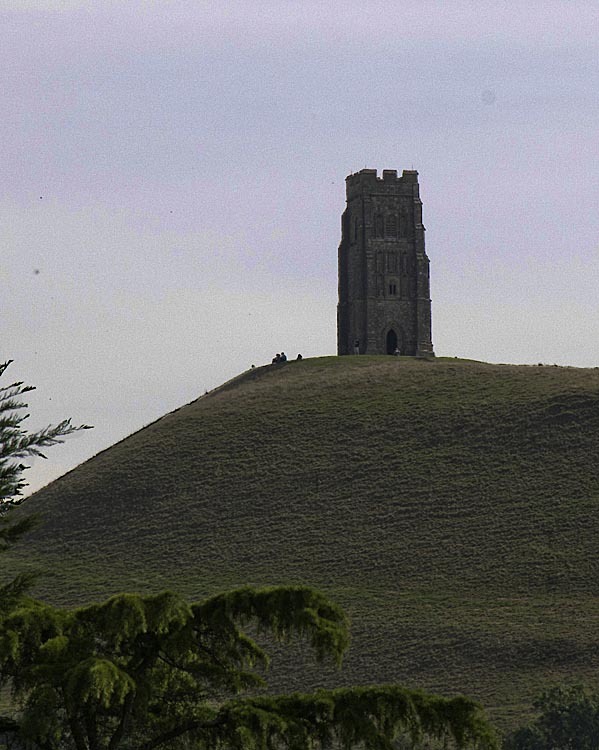 Just southeast of town is Glastonbury Tor, a 500' hill in the midst of drained fen land. An artesan spring,emitting iron rich water for eons appears to have hardened the sansdtone in its vicinity as the iron permeated the stone and oxidized. Over the millenia, the surrounding area weathered away leaving this singular hill jutting from the plain below. 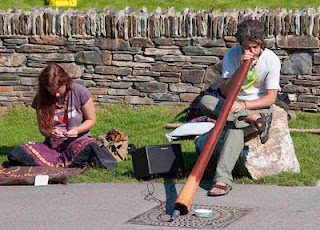 The Glastonbury whackos - the New Age Community in politically correct England - ascribe all kinds of mysterious myths and legends to Glastonbury Tor. These involve Joseph of Arimathea, the Holy Grail and of course good old King Arthur and the Lady in the Lake. In some Arthurian literature Glastonbury is actually identified as the legendary island of Avalon. During the 19th and 20th centuries tourism developed based on the rise of antiquarianism, the association with the abbey and the promoted mysticism of the town. As with many towns of similar size, the town center has seen better days and now supports a large number of alternative shops catering to the eccentric. 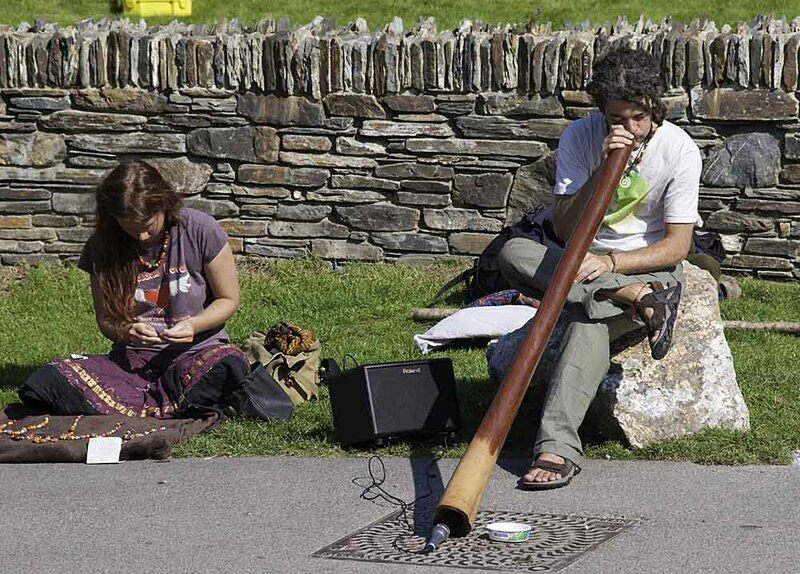 Glastonbury is currently famed for its eponymous Music Festivals which originally ran from 1914 to 1926. There is little link, beyond the name, between the those early festivals and the modern Glastonbury Festival, founded in 1970, which is now the largest open-air music and performing arts festival in the world. Although named for Glastonbury it is actually held at Worthy Farm 6 miles east of town. Get to know Glastonbury here.